Saint James Street is a vibrant and much-loved area of the city. It is an area that is beloved by those who call it home, and one that people are keen to keep as their own. Admittedly it might not be the most beautiful or elegant area, but it is an area that is culturally important to Brighton. For many years the Redroaster Coffee House, at the Old Steine end of St James Street, was a hub for those that converged in this area. It was a haven for the artists, poets and people of Kemptown, who appreciated its quality coffee and down at heel feel; things have, however, changed down at Redroaster. This once bohemian hotspot has gone through a transformation. Gone is the crumbling plaster and questionable structural integrity, and in its place a glorious space has been created that is like no other in the city. The Redroaster name remains, as does the superb coffee, but in all other aspects it has been renewed and reinvigorated. 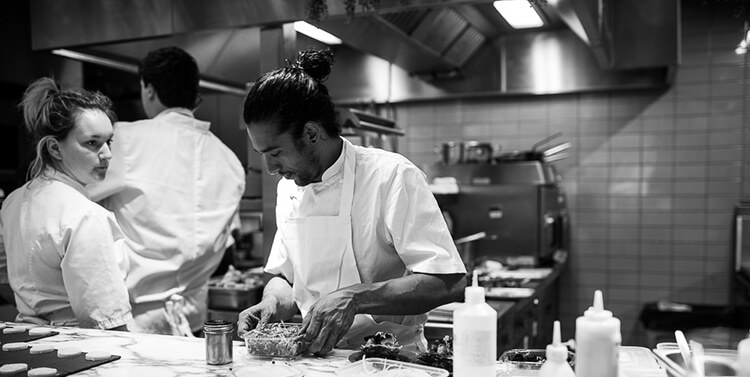 The biggest transformation is in the creation of an evening fine dining experience, Pike and Pine. It is the creation of Top Chef, Matt Gillan, who is part of the team that has brought about the regeneration of this once humble coffee house. Pike and Pine offers a choice of 6, 8 or 10 course tasting menus, with optional wine flights to compliment the dishes. 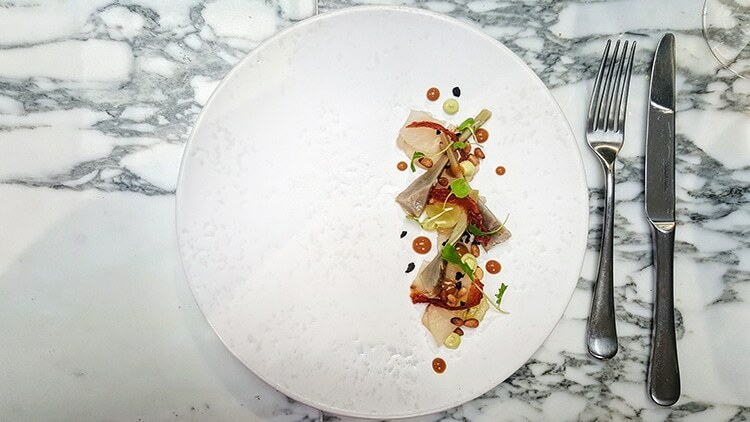 The food represents ten years of development and experimentation for Matt, who is one of the country’s leading chefs and innovators. Before we get onto the food, I need to mention the restaurant. The building is a stunning space to enter, like stepping into an oasis of light and sparkling surfaces. The bright white restaurant is dominated by the stunning full-length marble bar and pass. This monolith of a bar would look out of place in most restaurants, but here it is just one element of a space that is full of surprises. 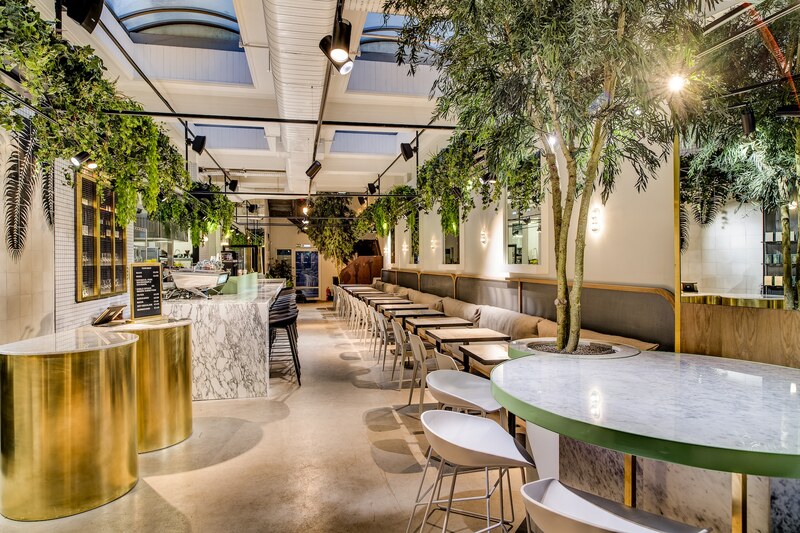 The indoor greenery softens the bright whiteness of it all, bringing the outside into the restaurant and creating a tranquil and relaxing environment. It is no wonder that its designer, Hana Hakim, won world designer of the year 2015/2016. 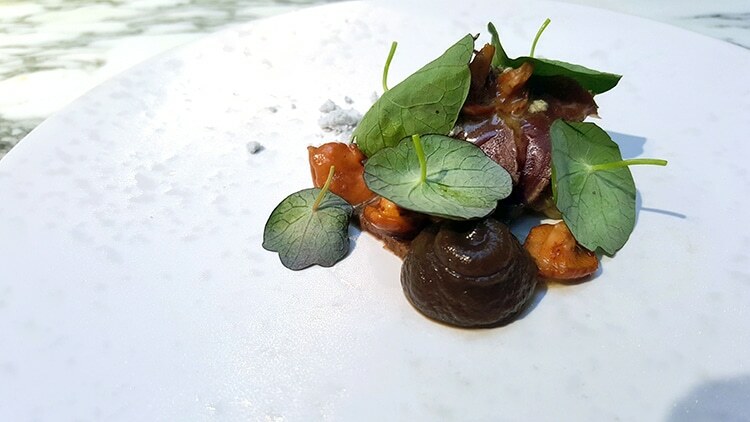 I am no stranger to the tasting menu concept, and it is one that is becoming much more prevalent in the city with restaurants such as The Set, The Little Fish Market, Pascere and Etch. also offering this dining style. For those who are not familiar, it is basically a set menu of smaller dishes that are designed to showcase the full repertoire of a chef. Some restaurants offer these alongside an a la carte, however at Pike and Pine this is not the case. 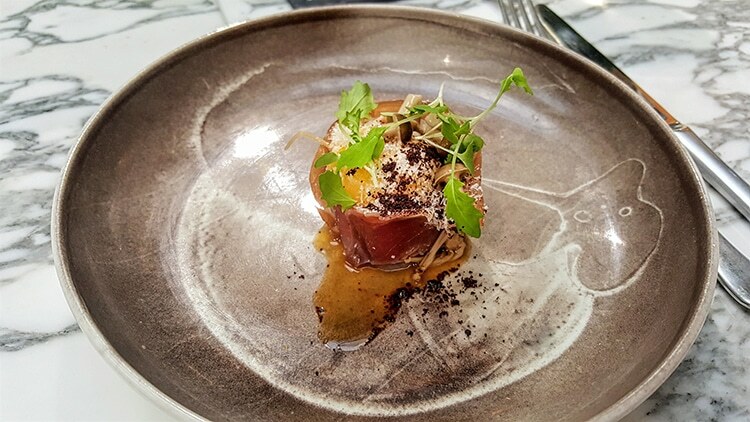 We spend some time deliberating over the three different menu options, eventually deciding on the 10 course option, as it had a number of dishes that sounded too good to be missed. As is often the case we kick things off with the snacks course. 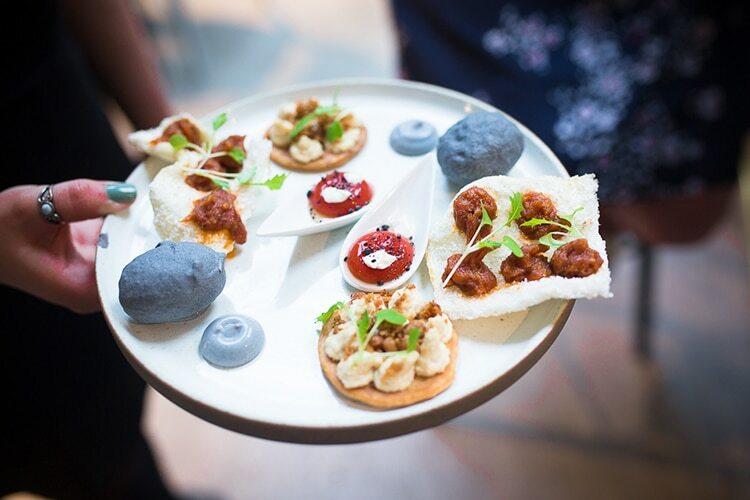 This course is often quite playful, a chance for the chef to try out some little nibbles that would not otherwise be included on a main dish. As soon as the plate landed we knew we were in for a night of food that would be as elegantly presented as the restaurant itself. My highlight was the sumac cracker with hummus which was delicately spiced and very fresh and light. The tomato with black olive was also deliciously balanced and fresh. Our first proper dish was oyster with cucumber and white chocolate. 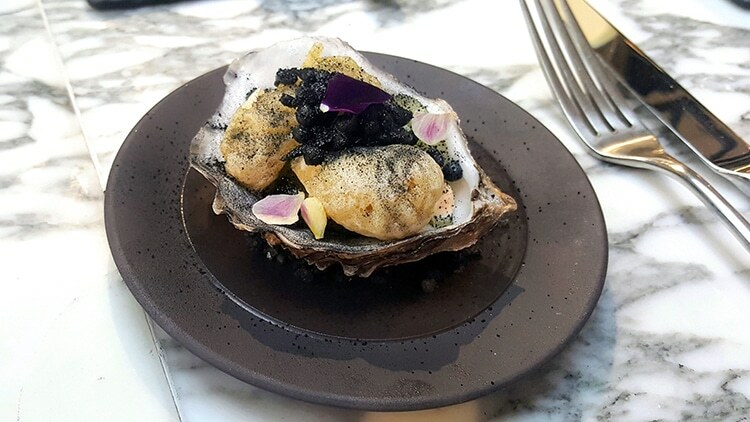 This gracefully dark dish featured deep fried oysters with spheres of white chocolate that had been coated with a black powder. The mixture of texture and flavours meant that it was as pleasing to eat as it was to look at. The second fish course was stone bass with artichokes and grapes. This delicate plate of food had all the softness and lightness compared to the darkly plated oyster. The flavours were subtle and well balanced with texture added through pine nuts and slithers of tomato. The next dish was simply listed on the menu as carbonara; an Italian staple that pretty much everyone knows for its simplicity and straightforward flavours. Being Pike and Pine there was a surprise to come. Comprised of miso marinated mushrooms, a crispy pancetta wrap and slow cooked egg yolk this was the highlight of the meal. An explosion of umami goodness, this dish was a superb twist on a classic that still retained the flavour characteristics of the original. The second meat dish of beef carpaccio with aubergine was another fabulous dish. Sweet aubergine purée and smoky beef come together to create a delicious dish that brings out the best in the key elements. A quick word on the wine; it is superb. We shared a single wine flight with the meal, and every choice was a winner. If you are unsure about wine choices and pairings I would highly recommend going for the wine flight. The next two dishes were the final savoury courses on the menu. These dishes were perhaps the most challenging in terms of the combinations of flavours on the palette. Matt is a chef that likes to give diners an experience that they cannot find elsewhere, and this is a feature of his cooking. First up was octopus with black pudding, radish and mango. 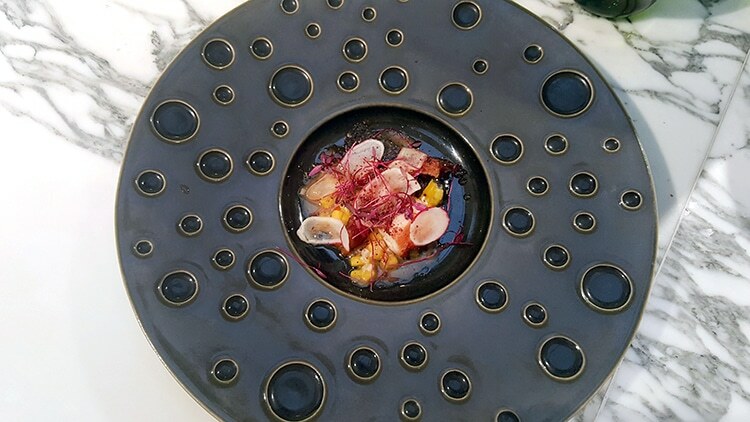 Another delightful dish to look at, with the bespoke serving bowls further enhancing the visual appeal. It was an interesting combination of textures and flavours that were certainly a talking point on our table. 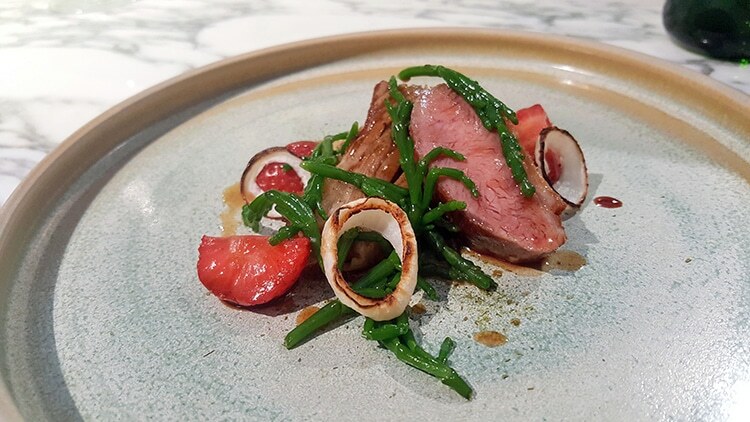 The second dish of lamb, strawberries and samphire also challenged our preconceptions of what works together. I’ve never been a fan of fruit and meat together and found this dish difficult to get on board with. The lamb was delicious and superbly prepared, and the strawberries were juicy and sweet; but I found the combination wasn’t for me. With this style of food you might not enjoy every combination, but you can appreciate the skill and vision that goes into creating each dish. 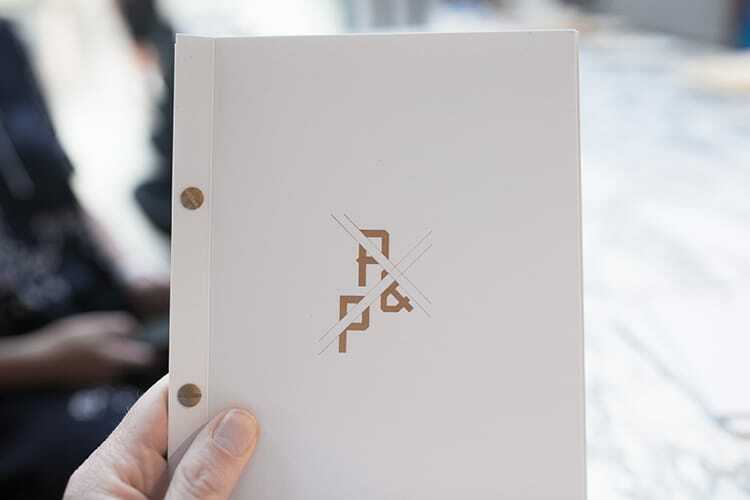 This is part of the experience when eating at restaurants like Pike and Pine. 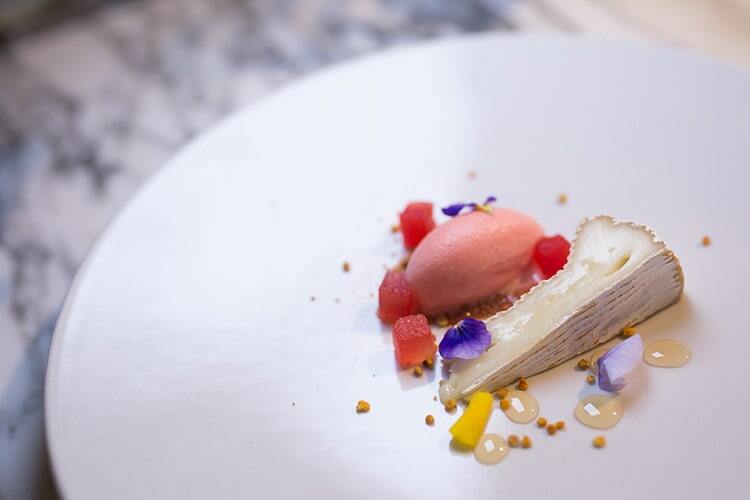 The cheese course of Wigmore, watermelon and honey put my cheese purist tendencies on high alert. 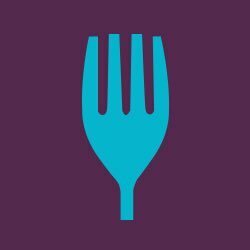 The dish has been well received in other reviews, and I can see why, but if you are a purist you might struggle with it. 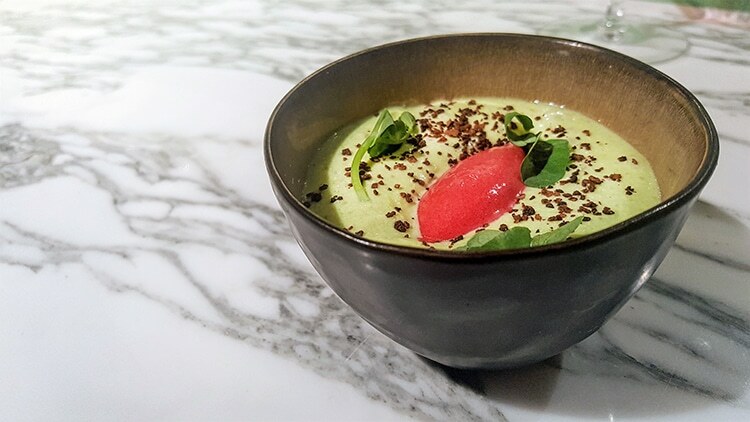 The Pre-dessert dish was a pea custard, which combined the earthy sweetness of peas with the tartness of raspberry and richness of coconut. 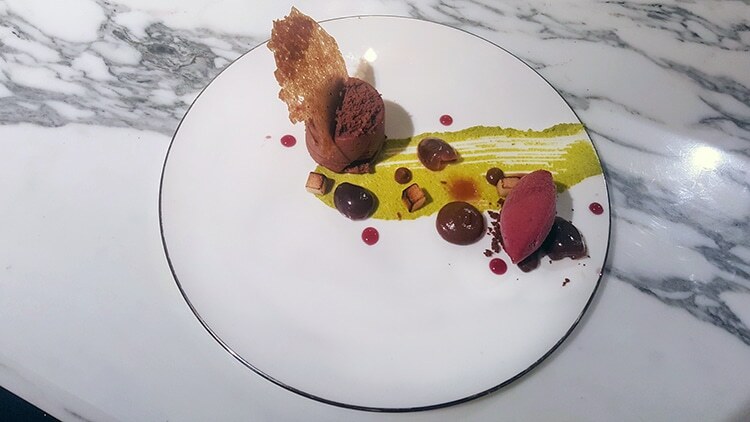 The flavours combined well and steered us confidently towards dessert. The meal was closed with one of my favourite dessert combinations of chocolate and cherry, with some almond thrown in for good measure. You cannot really go wrong with these flavours and the different elements brought them to you in a variety of textures and styles. It was a fitting end to an extraordinary dining experience, that took us outside of our usual comfort zones in terms of flavours and combinations.